Dorothy fascinated me, of course, with her sage youth quality. At age 4 I would purposefully get lost in K-Mart so that I could then wander to the customer service desk and ask them to announce over the loudspeaker that the mother of Dorothy Whitefield-Madrano should come retrieve her daughter, fully believing that if my name were Dorothy over the K-Mart loudspeaker it would somehow actually become Dorothy. But it’s not Dorothy I’d like to look at today, or Glinda the Good Witch, or the Wicked Witch, or even Ozma, the true ruler of Oz, whom you meet if you stick around the series long enough. They’re all fantastic characters, but as far as beauty goes, there’s one character whose existence cries for a shout-out here. "By the aid of the mirror she put on her head." I liked her anyway, or perhaps I just envied her. Having not just different hairstyles and outfits, but different heads?! It seemed logical somehow, for isn’t that an exaggerated version of what we’re doing sometimes when we play with makeup? Most of the time I’m trying to just be a more polished version of myself, and I think that’s true of most women—but sometimes I do want to transform, out of sheer curiosity (which some, like Baum, may package as vanity). We dye our hair to see what it’s like to be a redhead; we cut our hair to see what life as a pixie-cut cutie might be like. Princess Langwidere, being fictional, and fictional in a magical land at that, just had advantages the rest of us don’t. 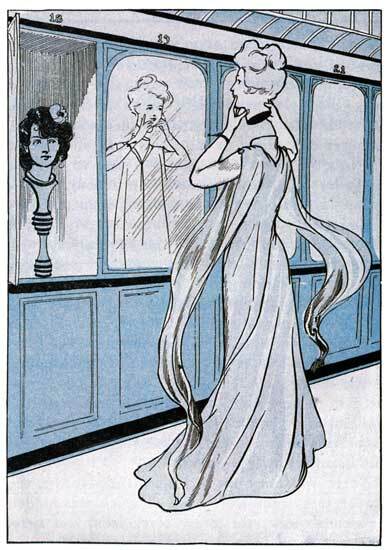 It’s also interesting that Langwidere is drawn as a Gibson girl, the “American girl to all the world,” according to her creator, Charles Gibson. The Oz illustrator was probably just going with the times—the Gibson girl was immensely popular when the book was written, so drawing an image of a beautiful woman meant to draw a Gibson girl. But the Gibson girl was a Langwidere-ish figure herself: Gibson used many models, creating no single, specific icon but rather a multitude of Gibson girls who were understood to be Gibson girls because they fit specific criteria. They were ladylike, young, and spirited, and of course they had that iconic hairstyle, which Princess Langwidere’s preferred head sports in all illustrations of her. They were specific but interchangeable—"logo girls," you might call them—making them perfect both for advertising purposes and for Baum’s mocking of women’s vanity. Is he saying we’re all Langwideres if we preen in front of the mirror and fall prey to new hairstyles? 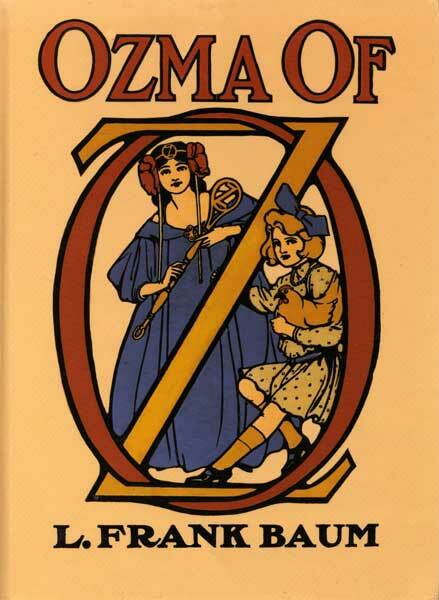 Is he saying ladies with real power—Ozma, for example, or the ever-plucky Dorothy—are above such nonsense? Princess Langwidere doing an early 20th-century lady gang signal on the right..
I’m not sure, and I don’t want to read too much into a minor character in a turn-of-the-century children’s book. But I don’t want to dismiss her either. In fictional characters—cartoons, icons, heroines, Muppets—we see women who are literally constructions, and when these characters catch on, it's an opportunity to see what constructions of femininity our culture responds to. 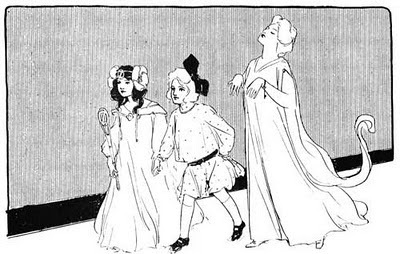 What can we learn from the Langwideres, Dorothys, and Glindas about our ideas of femininity? What can we glean from the Betty Boops, the Miss Piggys, the Darias about what we see as ideal in any given era? What fictional characters—specifically characters who haven’t been portrayed by live-action actresses, thus leaving their construction fully in the minds of their creators—have you been fascinated with over time? Do you base your ideas of a character’s beauty on their actions, their words—or, to borrow from Jessica Rabbitt, are they just drawn that way? I have nothing of value to add to the conversation but the "Return to Oz" movie of the '80s where Princess Langwidere makes an appearance (or 'appearances'... multiple heads joke!) was awesome. I remember being terrified! I guess her vanity was part of her terror where as Dorothy seemed naturally beautiful and unselfconscious about it. I don't know - know I want to rewatch the movie! I think she wasn't Langwidere there, but rather (merged with) Mombi - who was ambitious, and villainous. You are so right! I really DO need to rewatch to brush up on my facts... oy. Thank you! Some Oz aficionado I am! I haven't seen the movie! WEEKEND PLANS. Often when I see clothes with manifold pleats, frills, and appendages which fit so smoothly onto lovely bodies I think they won't keep that smoothness long, but will get creases that can't be ironed out, dust lying so thick in the embroidery that it can't be brushed away, and that no one would want to be so unhappy and so foolish as to wear the same valuable gown every day from early morning till night. And yet I see girls who are lovely enough and display attractive muscles and small bones and smooth skin and masses of delicate hair, and nonetheless appear day in, day out, in this same natural fancy dress, always propping the same face on the same palms and letting it be reflected from the looking glass. Only sometimes at night, on coming home late from a party, it seems in the looking glass to be worn out, puffy, dusty, already seen by too many people, and hardly wearable any longer. Ayeletd, this is both sad and lovely, and as I age I understand the feeling more and more. I'm happier with how I look now than I did at 25, but it was a surprise to finally learn that a good night's sleep was no longer all I needed for my "dress" to be shaken out. I know this is also (maybe even primarily) a text about aging, but I always read it as mainly being about the burden of carrying oneself whenever one goes. Like, how sometimes you wish you could just change out of your face and wear something else entirely. Not because it gets worn down, but just because - to always be wearing the same thing, everywhere? It speaks - like Langwidere, I guess - of a disconnect between body and self. Your boby is not part of you, instead it's something you have. I'll have to ponder the question of constructions a bit and come back to this. I've not read the Oz books in spite of living in Oz and was unfamiliar with this character with the interchangable heads, but recently standing outside a wax museum in Hot Springs, Arkansas, I found myself pondering heads and wondering why wax masks have never caught on. I suppose Japanese anime is full of these female constructions. Ooh, a wax mask fad would be the creepiest (and potentially coolest) thing ever! Like those latex rubber masks of presidents. Ironically enough I am working on a surreal coffee table book called "Some Assembly Required" that plays exactly into this. Princess Langwidere was a reference point for this project and is all about female vanity in todays society. I see you're in NY, if you have some time maybe you'd like to be a part of the project and we could show you as your own version of princess langwidere and her heads? 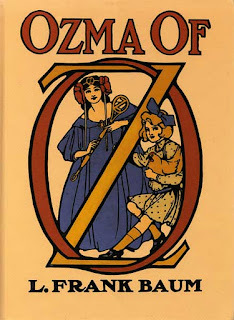 The second (Journey to Oz) and fourth (Ozma of Oz) are worth reading; I don't know enough about the others to say but it's worth looking at those two. I watched the movie for the first time in five years not long ago and was dazzled all over again--love, love, love! Not surprised to hear you're a fan too. Oh, to have multiple heads! I sometimes think our current ideas of beauty were created by trying to cram 'beauty of every kind' into the same body: thick black eyelashes but platinum hair, lithe limbs but melon-sized breasts, and so on. I love the idea of analyzing cartoon females. The Disney princesses suggest some interesting points.... Just did a search for "top female cartoon characters," and exactly half of the results were for 'sexiest' or 'hottest' characters. But that's the internet for you. Rebekah, I think you're onto something with the "every kind of beauty! at once!" thing. I also wonder if this is stronger in countries that are as diverse as we are--if there's less of that splitting in, say, Finland than there is here.